Sometimes life gets in the way of our plans and goals. I took six weeks off of blogging from mid-October to the end of November. It was unintentional. When I got close to posting again I was surprised it had been that long. I'd been sewing. But something had had to give. And blogging was one of the somethings. Today is my Dad's birthday. Two years ago, on his birthday he was diagnosed with cancer. He would have been 66 today, but he lost his battle with cancer on October 27th of this year. The past two years have been very hard emotionally. Many hours have been spent discussing death, dying, and cancer with my now 3 1/2 and 5 1/2 year old children. That is an exhausting task. I feared how I would help my small children through their first experience with death and with the loss of their grandfather. His health was a roller coaster, up and down over the last year and a half of his life. In the bad times, I watched him in pain, physically and emotionally. In the good times, he was back on his bicycle, where he loved to be. I found out about the cancer diagnosis right about when I was working to launch my blog. The news shocked me and delayed my blogging plans. My first post featured a quilt I made for my dad when I found out about the cancer. It was what I could do. At a time that I couldn't even talk to my siblings about it because they didn't know yet. I could throw myself into quilting and make something for him. That's one of the things that quilting does for me. It provides comfort in times that are hard. While the quilt was given to Dad, that quilt was more for me that it was for him. This project is the first project that I started after my dad passed away. An improv quilt had been on my bucket list, but I wasn't intending to start anything new before the new year. Somehow in that lost space of having lost my father, I did what I knew would comfort me. I started a new quilt. I cut out fabric. And I did it without a ruler. It was liberating. It gave me a place to spend time thinking of him while I worked on this project. It's healthy to grieve. But I think it's also healthy to not let grieving overwhelm you. As life went back to normal in the sense of my day-to-day routines, this project gives me a break from the routine. I don't know when I will finish it, but as I work on it I will be reminded of him. And again, this quilt is for me. I hope the process of making it gives me the space to process all the feelings I'm having. I hope that once this quilt is done I will be able to look back and think that things are somehow just a little bit easier. Right now things are still feeling very hard. I haven't really done a lot of improv, mostly just a few bee blocks. And when I "improv" I usually still use a ruler and 90 degree angles. 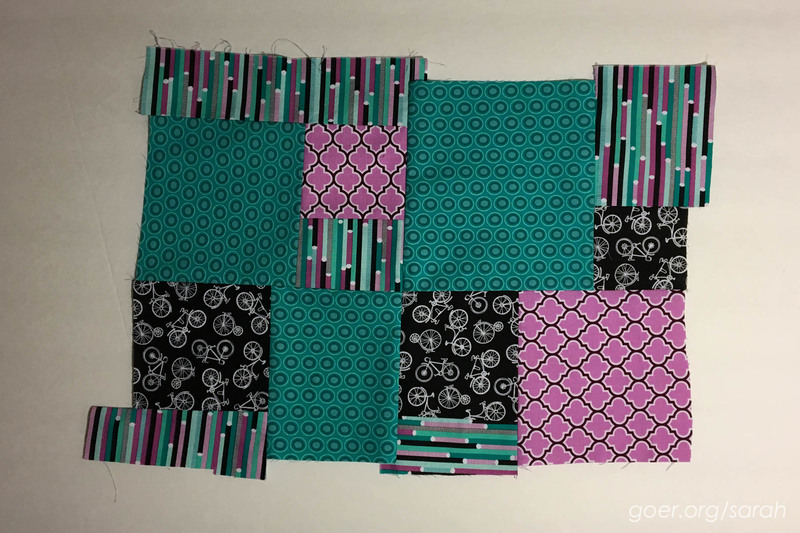 This project was born from my own set of adaptations to Sherri Lynn Wood's Floating Squares score, from her book The Improv Handbook for Modern Quilters. I really enjoyed hearing her speak months ago and bought the book when it came out. As a perfectionist, rule-follower I really appreciate that her improv has some guidelines. In practice, I am enjoying it all just going together, without the picky worry of perfect points or perfect seam allowances. I guess the true test will be how much I love it when it's done. I know Sherri presses her seams any which way... I was struck by the slide she showed us of the back of one of her projects. As a press-seams-open-er I thought it was complete madness. You can see here that I tried desperately to stick with pressing seams open. That middle seams was just wonky enough for that to not be happening there. I've darted in a couple places and I've pressed seams how the fabric wants them to be pressed. I can definitely see how important this flexibility would be in a project that had more curved piecing. I'm already seeing that the longer my seams get the more likely something is a bit amiss. For those of you who are familiar with Floating Squares, one of the adaptations I've made was how many different fabrics I'm using. Seven. 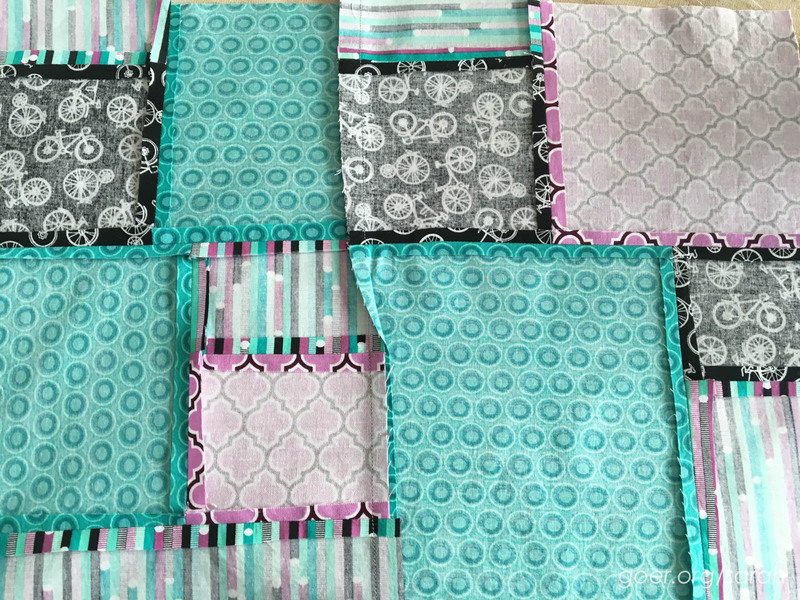 While I love the look of the basic three fabric versions, I wanted to work from my stash, and the larger cuts of fabric just weren't speaking to me so a number of my chosen fabrics are from half yard cuts. I have a vague notion that I'm working in three zones; these are parts of zone one. I'm a bit of a blender addict. I don't buy much in the way of multicolored prints, and when I do, I find it hard to use them. 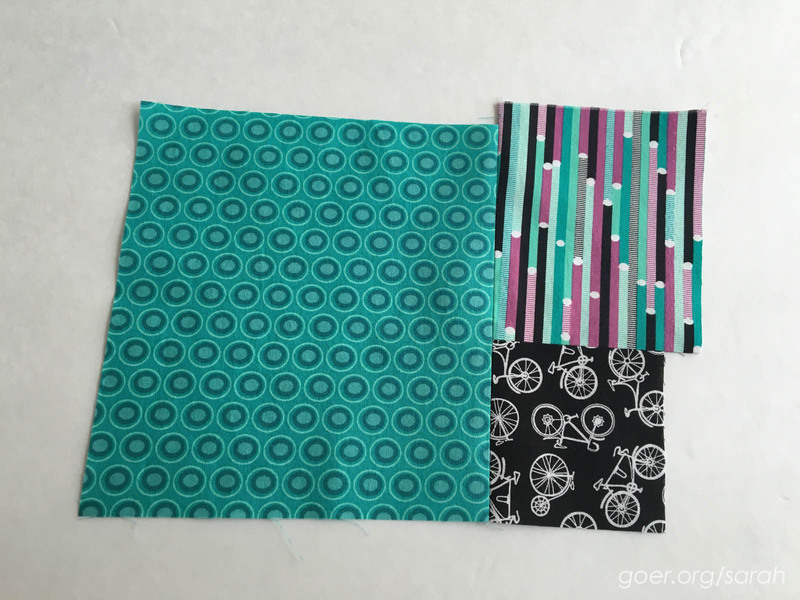 I decided to use the stripe fabric as my filler fabric, and cut my squares from the blenders and bicycle print. I'm trying not to overthink the selection of pieces to put together and I'm enjoying the process. I think one of the challenges of improv is knowing when you're done. In my case, when I run out of fabrics, I think I'll be done. I have no idea how big the quilt will end up being. That feels so weird and backwards. 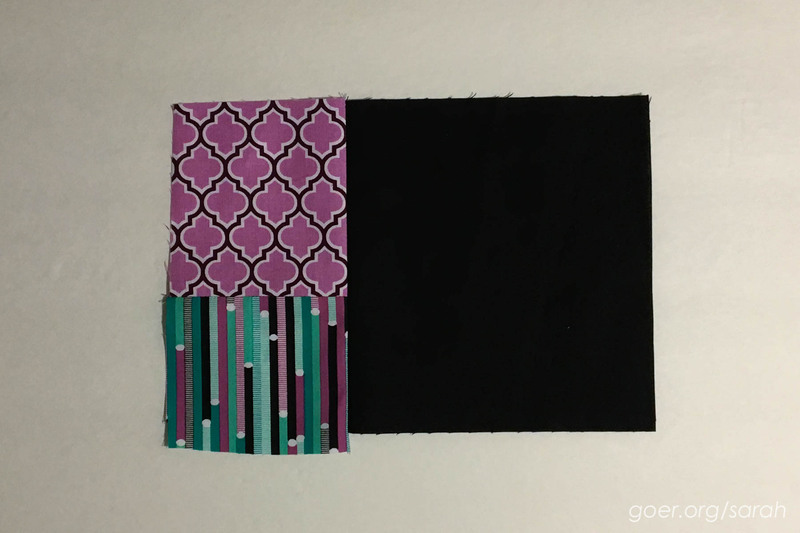 The solid black will be used in another zone of the quilt. Since I want some of my fabrics from the other two zones to cross into the zone with the black, I've started making some units with the black. And true to form, I'll likely jump back and forth between the three zones so I don't get bored. There's a rough vision in my mind. Time will tell if this is going to come out as I'm envisioning it. Posted in Quilting. 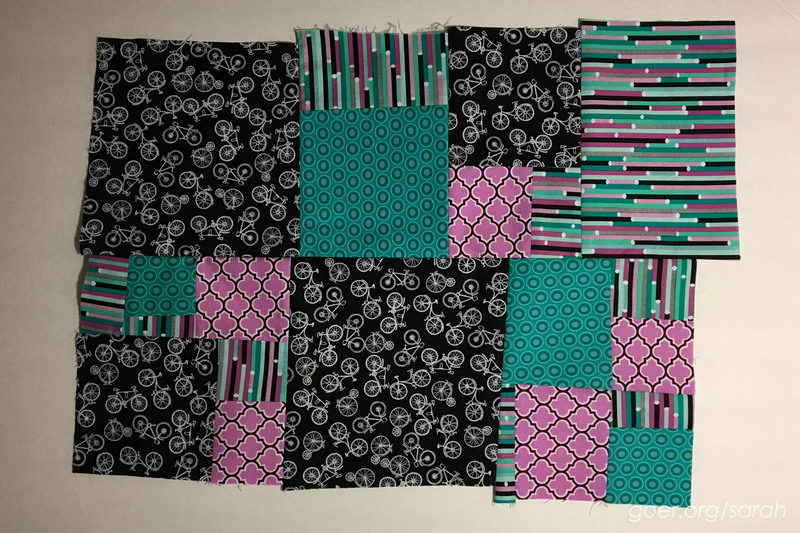 Tags: floating squares, improv, improv blocks, Improv Handbook, improv piecing, improv quilt on December 12, 2015 by sarah. Sarah, I'm so sorry to hear about your father passing away. I do believe that immersing ourselves in a project can be healing and long stretches of quiet time are essential for the grieving process. I look forward to seeing your progress on this improv quilt. I think being able to work outside the rules on this project will free your mind from the difficult emotions you are dealing with. The aqua and fushia are bright, cheery colours and the black makes them pop. So glad you took the time to post today. It sounds like this quilt is a great piece of therapy. 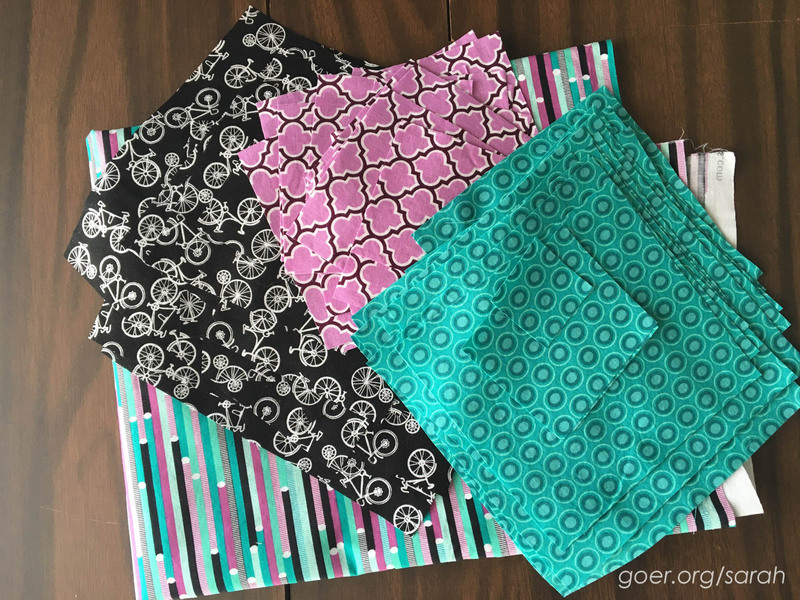 I love that you mentioned being on his bike was your father's favorite place to be and that there are bicycles in your fabric pull. Thank you, Yvonne. Bikes will be one of the things that I think we always make me think of Dad. So sorry to hear about your dad, I'm glad you have your quilting to give peace, even if it's only a patch at a time. I love your blog, thanks for sharing it with us. My sincerest sympathies on the passing of your father. No surprise that his loss has been hard on you. No matter how much you brace for the inevitable, it still comes as a shock. May time be kind to you and this quilt be a reminder of all good things of your father. I'm so sorry for your dad's passing. It's hard. My own dad was recently diagnosed, and life seems to change overnight. My thoughts will be with you this season. Thank you, Julie. I'm sorry to hear of your dad's diagnosis. Best wishes to him and please remember to take care of yourself during this hard time. Sorry to hear about your dad. Your improv piece is great. Love the fabric choices. Thank you, Anja. I'm really enjoying the fabric. It is always fun to work with a new color scheme. Sarah, I am sorry to hear about the loss of your father. When I lost my father, it took me a while to process my emotions and allow myself to work on my quilting again. I think it is beautiful that you are able to let yourself feel and let the fabrics speak and lead you where you are going. Love the colors in your improv piece and can't wait to see where it goes. Thank you, Tish. A lot of my stress-relief of the past couple years has been through sewing/quilting. So sorry to hear of the death of your Dad. Your post is an uplifting read with love etched in your words and between every line. Hope the freeing patchwork technique combined with writing the blog does help you - you are a natural writer! Oh, thank you so much for your kind words. This was a beautiful post, Sarah. I'm sorry about your Dad. Quilting is the best therapy. I can't wait to see this one evolve. So glad you could do this while dealing with your grief. Are you able to share the finished quilt please? Hello Varsha. Thank you for the message. The quilt isn't finished. I've taken it out to work on from time to time. I will certainly post more photos on the blog when it's finished. I'll try to put up some progress photos next time I have it out. Thank you for visiting!